I hadn’t much time lately and I reserved my few hobby breaks to crochet a bit. I must Indeed say that spring filled my mind with a lot of crochet flowers projects. And at least one of these has seen the light ☺. 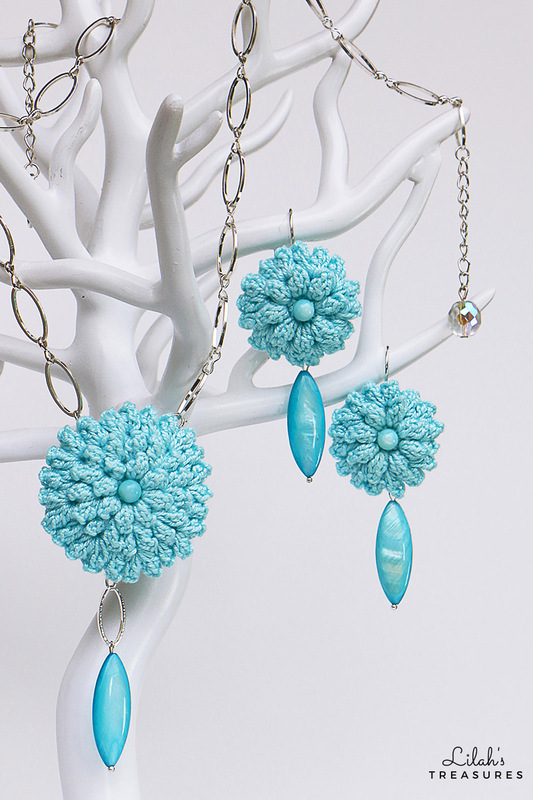 I’m happy to show you my popcorn flower necklace and earrings set! I had lots of fun learning how to crochet this super cute flower I had introduced you in my last post. I really wanted to create more flowers and use them somewhere. But, before turning my small apartment into a garden 😂, I needed a concrete project. So, thinking to my summer wardrobe, I got the idea of crocheting some jewellery pieces for my vacation days, and exactly of embellishing a white short dress I love to wear during my sea-holidays. 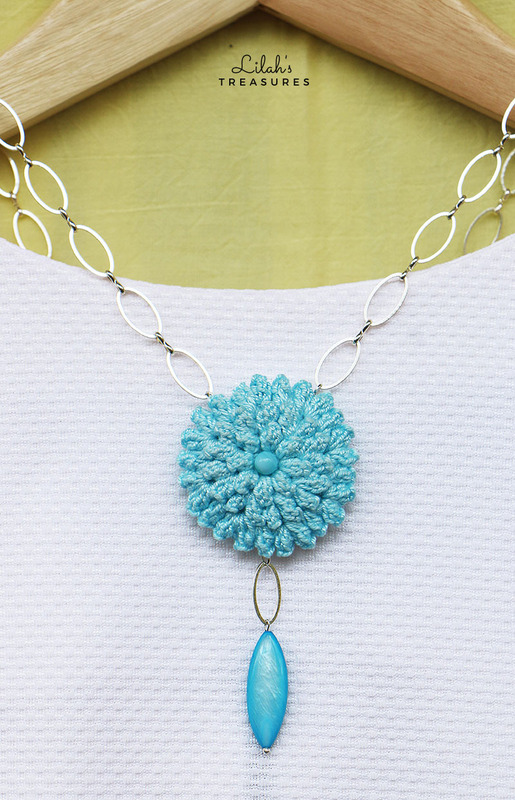 Then I started imagining the design of a necklace including this special crochet flower. Light-blue sea water memories suggested me the color of the cotton thread to use, also well paired with the dark orange of a terrific swimsuit I bought last year. And some beautiful mother of pearl beads, stored at home, were perfect to decorate my necklace and the coordinated earrings I decided to create afterwards. 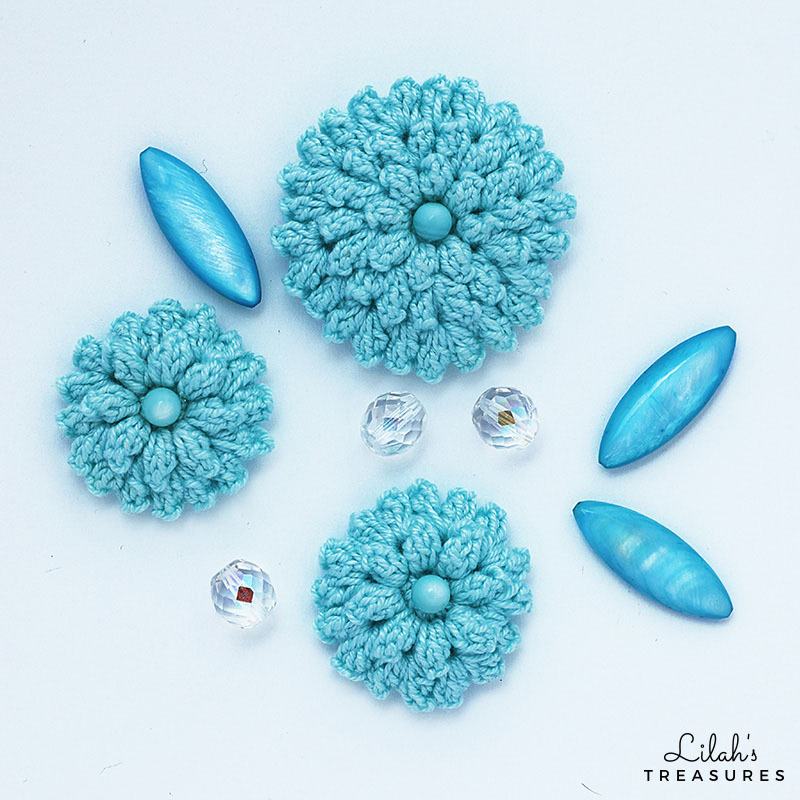 The iridescence of the turquoise dyed shells creates an amazing effect and recalls exactly the crochet thread I used for the flowers. 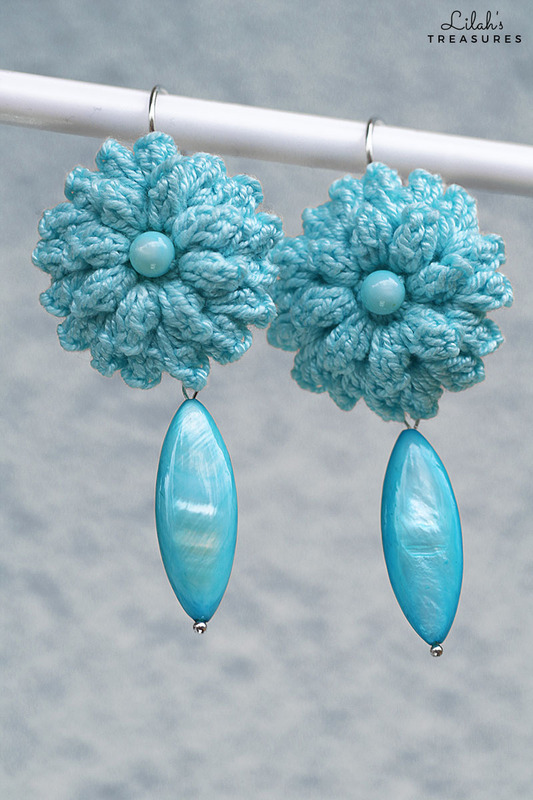 I crocheted 3 flowers (find here the pattern link): 2 small ones for the earrings and a big one to be utilized like a pendant for my necklace (respectively only 2 and 3 crochet rounds, according to the circular pattern). I used a 1,50 mm crochet hook. After having followed the instructions, a small hole showed in the center of the work, which was exactly the right place where to sew a 6 mm mother of pearl bead, representing the flower center part. The result is so lovely, isn’t it? One note about this crochet pattern I was glad to learn, is that the back of the flowers is slightly hollow (1). So you might consider to fill the depressions with some stuffing, like I did. I exactly cut 3 round shapes of thin felt (2) according to the sizes of the flowers diameters (small ones 2,5 cm and big one 4 cm), and stitched these hard fabric pieces to the flowers back (3). Thanks to this, the reverse sides of my flowers looked very neat and they could easily be included in my design. To complete my necklace, I simply attached two jump rings to some crochet chains in the back of the biggest flower, so that I could connect both sides of the pendant to the light aluminum chain I chose. And, as a finishing touch, I let a oval, mother of pearl, turquoise bead hang from the flower. Same decision for the earrings design, enriched by means of these marvellous beads. I glued the backs of the smallest flowers to the round bezel bases of two ear clips, which I preferred to use instead of the normal ear wire hooks. Then I connected the turquoise long beads at the flowers bottom parts by means of some jump rings. Their gorgeous opalescence gave the jewels a really pleasant dynamic look. I ♥ my new necklace and earrings. What I can say is that the effort for creating this set was minimal, because I had to learn only one flower pattern, but the result was really great and appreciable. 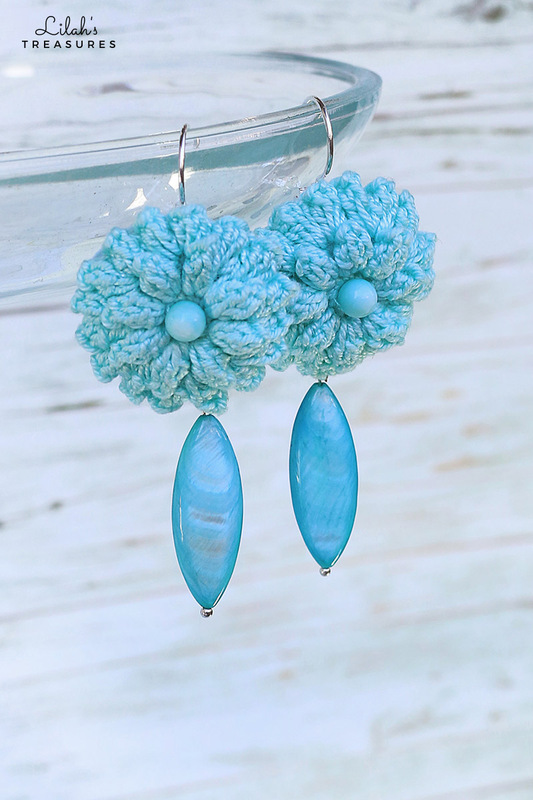 This kind of crochet flower is so cute and beautiful and can be used in many different ways, depending on what your creativity suggest you. I hope you enjoyed reading my post, dear friends. Have a lovely weekend ☺!